Developed by Marriott’s Multicultural Affairs team and informed by real scenarios at actual hotel properties, the Culture Day curriculum gives attendees an overview of appropriate cultural terms, business and social protocols, traditions, trends, cuisine and clothing. In any given session, participants hear real-life scenarios and are immersed in distinct cultures. 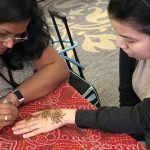 For example, Indian Culture Day participants absorb the history and significance of henna through the work of an on-site henna artist and learn about Indian attire through a sari tying demo. The significance of a bar and bat mitzvah is explored during Jewish Culture Day and the key events of a quinceañera are reviewed during Mexican Culture Day. All sessions include food, guest lecturers, candid conversation surrounding real-world scenarios and practical and actionable takeaways for the thousands of participants who opt into the innovative program annually and routinely offer rave reviews.